Thanks to Celebrity Attractions for offering a Pre-Sale Fundraiser. 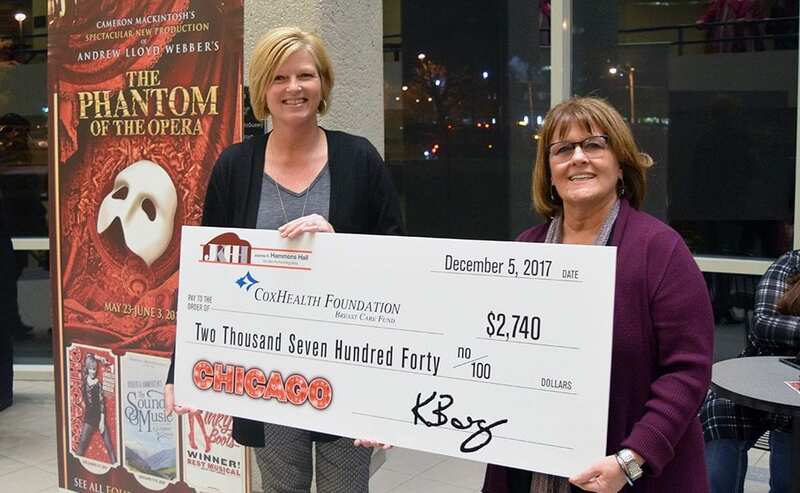 For every ticket sold during a special pre-sale ticket event to “Chicago” at Hammons Hall, $5 was donated to the CoxHealth Foundation Breast Care Fund. During the Tuesday night presentation of the show, a check was given to Donyta Upton, CoxHealth Women’s Center director by Deb Gallion of Hammons Hall on behalf of Celebrity Attractions. This is the 5th year this special pre-sale event has support this fund which helps women with breast care and breast cancer health care needs.